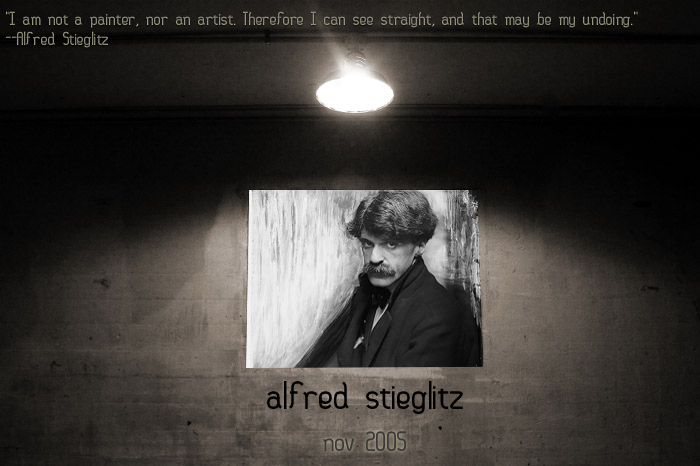 Stieglitz, an American photographer, probably did more than any other individual to promote photography as an art at the same level as other arts, and has been dubbed the "patron saint of straight photography." It is said that at the age of eleven he had begun to take an interest in photography, and learned by observing a local portrait photographer work in the darkroom. His blunt nature often came over: on one occasion he observed the photographer re-touching a plate, and on enquiry, was told that this made the subject look more natural - to which he replied "I wouldn't do that if I were you." He studied mechanical engineering and photography at the Polytechnic of Berlin. In 1883 Stieglitz saw a camera in a shop window in Berlin, bought it, and photography in earnest began. Many years later he wrote "I bought it and carried it to my room and began to fool around with it. It fascinated me, first as a passion, then as an obsession." From 1892 he was becoming famous for his photographs of everyday life in New York and Paris. There is a tremendous atmospheric quality in many of his outdoor scenes. A shutter working at a speed of one-fourth to one-twenty-fifth of a second will answer all purposes. A little blur in a moving subject will often aid to giving the impression of action and motion. In order to obtain pictures by means of the hand camera it is well to choose your subject, regardless of figures, and carefully study the lines and lighting. After having determined upon these watch the passing figures and await the moment in which everything is in balance; that is, satisfied your eye. This often means hours of patient waiting. My picture, "Fifth Avenue, Winter" is the result of a three hours' stand during a fierce snow-storm on February 22nd 1893, awaiting the proper moment. My patience was duly rewarded. Of course, the result contained an element of chance, as I might have stood there for hours without succeeding in getting the desired pictures." In 1902 he became one of the founders of the Photo-Secession, a group of talented avant-garde artists. In 1905 he also founded and directed the Photo-Secession Gallery in 291 Fifth Avenue, New York, a gallery which came to be known as the "291", and which exhibited not only the work of contemporary photographers, but also works of Picasso, Rodin, Matisse and Toulouse-Lautrec. "The result is the only fair basis for judgment. 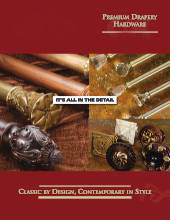 It is justifiable to use any means upon a negative or paper to attain the desired end." Stieglitz, committed to the idea of photography as art, often found this challenged. "Artists who saw my early photographs began to tell me that they envied me; that my photographs were superior to their paintings, but that unfortunately photography was not an art.... I could not understand why the artists should envy me for my work, yet, in the same breath, decry it because it was machine-made - their...'art' painting - because hand-made, being considered necessarily superior....There I started my fight...for the recongition of photography as a new medium of expressions, to be respected in its own right, on the same basis as any other art form." "For Camera Work as a whole we have no words of praise too high, it stands alone; and of Mr. Alfred Stieglitz American photographers may well be proud. It is difficult to estimate how much he has done for the good of photography, working for years against opposition and without sympathy, and it is to his extraordinary capacity for work, his masterful independence which compels conviction, and his self-sacrificing devotion that we owe the beautiful work before us." "There were men and women and children on the lower deck of the steerage.... I longed to escape from my surroundings and join them....A round straw hat, the funnel leaning left, the stairway leaning right.... round shapes of iron machinery... I saw a picture of shapes and underlying that, the feeling I had about life..."
Stieglitz did much to promote photography, and to get it talked about. There were two stages in his life: at first he produced somewhat romanticised pictures of an Impressionistic style, then later moving over to realism of a high order. He also had pronounced views about the current controversy over amateur photographers and the professional. Not the easiest of people to get on with, his leadership was little short of dictatorial and he was an insufferable egocentric windbag, but he made a distinct and influential contribution to the development of new styles of photography. He was a visionary of the highest order. His own photography alone makes him stand out as one of the greatest of photographers; his influence over photography has been enormous. Alfred Stieglitz wrote of this wintry urban scene: I found myself in front of the old Post Office. The Third Avenue street railway and the Madison Avenue car systems had their terminals there, opposite the old Astor House. It was extremely cold. Snow lay on the ground. A driver in a rubber coat was watering his steaming car horses. How fortunate the horses seemed, having a human being to tend them. …The steaming horses being watered on a cold winter day, the snow-covered streets...[expressed] my own sense of loneliness in my own country. Recently returned from nearly a decade in Europe, Stieglitz found not only his subject matter on the streets of New York but also an emotional relationship with the city's anonymity and alienation. This photograph, with its physically tight spaces and faceless inhabitants, expressed Stieglitz's mood in somber tones. Gelatin silver print, 3 1/4 x 4 7/16in. A locomotive engine steams toward the camera on its barely visible tracks, wearing a billowing black cloud of smoke like a plumed hat. The criss-crossing lines of tracks beside it snake off toward the horizon, and the telephone poles at left appear to be making the same march. 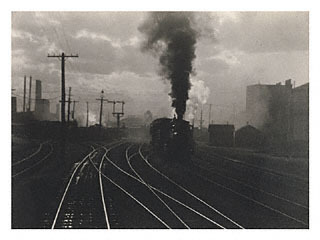 Alfred Stieglitz's composition is a treatise on the importance of the machine in the modern Industrial Age. The title of the photograph, The Hand of Man, sets up a comparison between the machine that is depicted and the human artistic impulse that created the image. Photogravure, 13 3/16x 10 3/8 in. 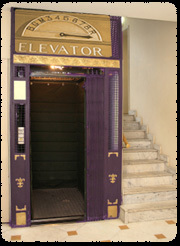 There were men, women and children on the lower level of the steerage.…The scene fascinated me: A round straw hat; the funnel leaning left, the stairway leaning right; the white drawbridge, its railings made of chain; white suspenders crossed on the back of a man below; circular iron machinery; a mast that cut into the sky, completing a triangle. I stood spellbound for a while. I saw shapes related to one another—a picture of shapes, and underlying it, a new vision that held me…"
Twenty-five years after making this photograph, Alfred Stieglitz recalled the moment in vivid detail, no doubt aided by the information provided within the frame. He had wandered down from the first-class deck to survey the jumbled scene of teeming passengers in the steerage, or economy class, section, which contrasted sharply with "the mob called the ‘rich'" that he had left behind. 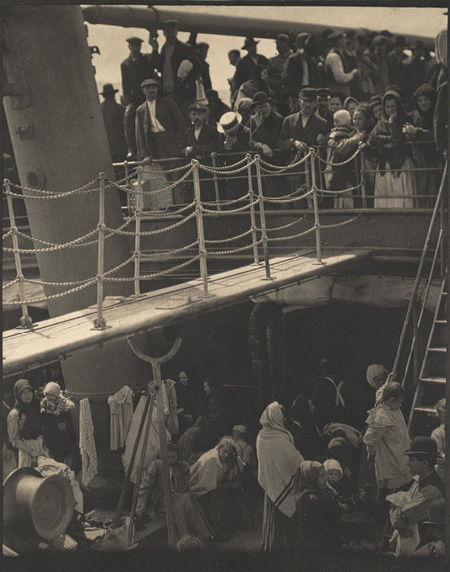 Stieglitz's compressed composition emphasized the closeness of space and bustling conditions in the steamer's lower-level accommodations. Gelatin silver print, 9 3/4 x 7 1/4 in. All I know about myself is that I am an honest workman.—And that good workmanship is ever a passion with me.—And as I age the passion becomes more intense. Borders on mania. Alfred Stieglitz wrote this description of himself to a friend in 1920. Can that self-portrait in words be reconciled with the photographic self-portrait of a younger Stieglitz, made thirteen years earlier in his career? Here he appears as an intense, determined man, possibly passionate but hardly manic. The intensity of his bespectacled gaze, a metaphor for his visionary career, suggests the skill that he described and that he applied to his trade. 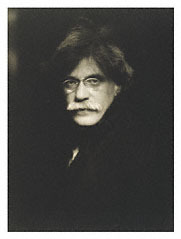 Some twenty years after he made the negative, Stieglitz still thought this photograph faithfully portrayed him; he then made this print as a gift for his wife, the painter Georgia O'Keeffe.